My earliest memories involve my mother. And her behavior that scared me. By age five I learned when Mom got all excited and went shopping and had parties, the best thing for me to do was disappear because what came next was instant anger and whippings. I managed most days to stay out of her sight. I hid under my bed or the dining room table until I had to show up for meals. As teens, my sister and I observed that Mom had “spells” that lasted for weeks. She would act normal for a few months then a spell would started with exuberance, fast talking and fast driving. As her thoughts and actions sped up, she turned angry and critical. Nothing I did was right. Nothing I wore looked right. Any mark less than and “A” on a report card meant I was a failure. I felt incapable, incompetent and unloved. I started wondering during her spells, “What is she thinking? Why does she act this way? Doesn’t she know others are talking about her?” All I wanted to do was get away from her—permanently. I did at age seventeen. I married and moved to England. It would be another ten years before I began to comprehend what Mom was experiencing. 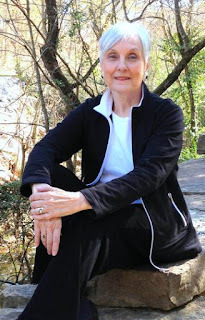 My viewpoint of her behavior changed radically after my thyroid medication was changed to a new type of pill. The new pill was a colossal mistake. My body went into a tailspin. 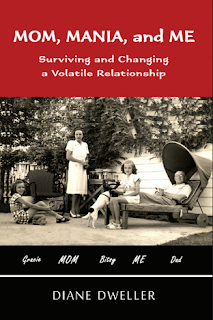 The following is an excerpt from my book: Mom, Mania, and Me, Surviving and Changing a Volatile Relationship. About the fourth month on the new pill my behavior really started to change. For two horrible weeks each month I turned into the Wicked Witch of the West. Dark circles surrounded my eyes making me look like Alice Cooper. If I wasn’t screaming at everyone, I was crying about every little thing. I became aggressive, angry, irritable, anxious and just plain mean. I kept exploding like a PMS time bomb. After my period would start, Glinda the Good Witch appeared, loving everyone and all of life—happy, cheerful, caring. Two weeks later, the circles would reappear and my fangs emerge. I felt utterly powerless to control my emotions. I became frightened. Bewildered. This vicious cycle had to stop. I called and made an appointment with the internist and had to wait two weeks—two long, screaming, threatening, crying weeks. “I doubt the new pill has anything to do with your behavior,” he stated emphatically, “but I’ll order another thyroid test.” All the thyroid tests came back normal. My children started disappearing from my presence, like I used to disappear from Mom’s. I apologized, promising them and myself every month that I would be nicer. Month after month, I failed miserably. Rex took the brunt of my anger, confused as to who this banshee was. I hated the feeling that I was out of control, taken over by someone else I didn’t recognize and abhorred. I started to wonder if I might be possessed by a demon like those people in the Bible. He tested my thyroid again and once more reported everything was normal. Normal? Yeah, for Hell. I felt trapped in a netherworld I could not control, could not escape. A sneaky thought of suicide scared me. How can I survive thirty or forty more years of this? I have to get better. I can do it if I try harder. I can’t stay stuck in this up and down cycle. I’m getting like Mom. Oh God. Please not like Mom. I held onto what sanity I could, trying to behave better, failing each month. I hated myself. I knew I acted terrible. I struggled to curtail my ugly behavior, my ugly words. Would I ever be normal again? How? When? In the middle of this turmoil, we moved to Vancouver, Canada. I went to a new doctor. The Canadian doctor listened to my still tearful tale of woe, tested my thyroid again, perhaps with a different blood test and immediately determined that the dosage of the new thyroid medication was wrong. He reduced it to one-fourth of the amount I took—and an unquestionable miracle occurred in the next few months. Life became not only bearable again, but incredibly wonderful with exciting surprises. My hands and feet felt warm for the first time in my entire life. The inner turmoil vanished. The roller coaster came to a stop. I learned to laugh again. What a difference the wrong and right amounts of one tiny pill had made in all our lives. My seismic upheavals had been caused by taking too much of a medication to replace a missing natural body chemical. Did changes in my thinking and feelings duplicate in any way Mom’s changes during her spells? She also took a thyroid supplement. It appeared she could no more stop her periodic ascensions to Planet La La than I could stop turning into that dreaded Thyroid-a-saurus every month. What could be stimulating her behavior, causing her body and brain to act like it does? Could there be a pill she needs? Or one she should stop? During a spell did Mom feel like I did? Out of control? Helpless to stop the changes? Did she even realize her personality and behavior changed? I had never before considered how Mom might view her spells. For the first time I considered her inability to control her behavior with some understanding. A hint of compassion found a pace in my heart. It would be two more decades before Mom’s spells would be diagnosed as bipolar disorder. Coping with her manic antics after the diagnosis wasn’t any easier, but after walking a year in her moccasins, never again would I view her “spells” without empathy. Diane Dweller may be contacted via her website: www.dianedweller.com. Her book Mom, Mania, and Me is available via Amazon in both print and ebook formats. The first chapter is available free on the author’s website.